At NAB this year, the main entrance had a large Blackmagic hoarding (called billboard in some countries). In earlier years this was the space used for Apple's hoardings. 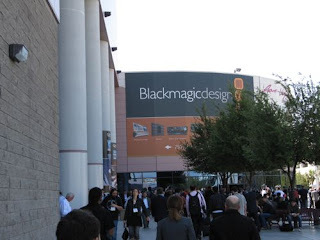 And as one walked into the South Hall, one couldn't help notice that Blackmagic had what appeared to be the largest booth in the hall. And they had announcements to match. And other new products, some for USB3. None of those work on a Mac as yet. But the most interesting new item was undoubtedly Resolve for Mac for $ 995. Make no mistake, this is going to make a difference to colour grading as we know it. In the days that followed, forums were abuzz with discussions. At the Creative Cow, the Apple Color forum saw one of the longest threads discussing this new Resolve. To put things into perspective, this new Resolve will not be available till June 2010. It will work on a 8-core MacPro preferably the faster 2.66 or 2.93 GHz version. it will need as much RAM you can afford to put in, but I suspect at least 12 Gb will be needed. The stock nVidia GT 120 card that ships with the MacPro will deal with the primary display. And you need a nVidia GTX 285 card for the actual colour grading processing. This additional display card runs $ 449 at the Apple Store. And you cannot connect a display to it. It is used only for processing. So it effectively replaces the 'Transformer' cards in the old Resolve Linux. So even if the software costs $ 995, you'll need a $ 15,000 Mac and monitors to go with it before you can own a sensible grading solution. And a Tangent Wave panel that runs $ 1700. 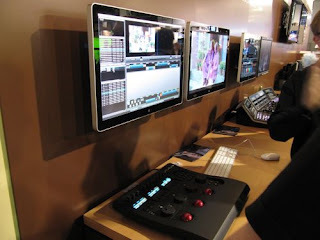 My colorist colleague Jayadev put the Resolve on Mac through its paces. And reported, happily, that at first glance this Resolve performs just like the older Linux Resolves. Many primaries and secondaries still played real time even with 2k DPX frames. Other conform functions worked as usual too. And there was built in dust-busting to de-spot film while grading. The BM Resolve on Mac needs a Blackmagic HD Extreme card for video output. So if you already have a Kona, you're out of luck unless BM supports it with drivers. For a grading panel, this Resolve works happily with a Tangent Wave. 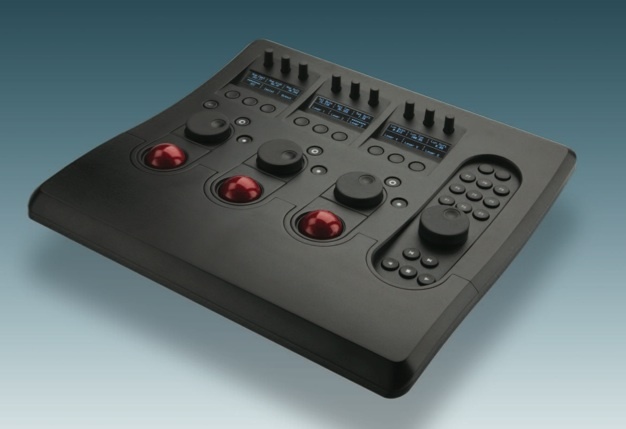 If you need more control, you can look at Blackmagic Impressario panel for $ 30,000. Of course, if you buy that panel you'll get the Resolve software free with it. The new Linux version is also available for $ 20,000. Coupled with the panel you can get a new Linux Resolve for about $ 60,000 (with system and monitors). And there's more. With the HDLink Pro, there's support for an external Display at 10-bit 4:4:4. And 3D stereoscopic as well. But how well these features work will be evident only after the software becomes available in June 2010. Conclusion. Colour grading for small and indie films has become even more affordable. Some argue that this new Resolve won't threaten the big-ticket 'pro' systems like Quantel iQ or Baselight. Yes it probably won't. But it I don't think BM is after that. I think this new Resolve will sell in large numbers. Big productions may or may not use it in a big way, but the small to medium post houses will. With the cost of systems going down, a lot of trashy colour grading will happen. But in the long run, this will make people realize the need for a professional colorist. And eventually hire one. 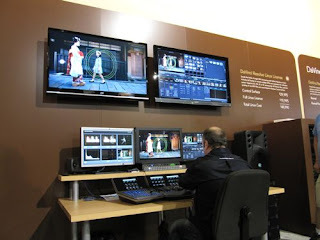 The value of a good colorist will not reduce as systems get cheaper just as the value of a good editor has not diminished even with editing systems getting cheaper over the past decade. Labels: Blackmagic Resolve, BM Resolve on Mac. Resolve Linux, Resolve on Mac, Tangent Wave for Resolve. I'm trying to make a post on my iPad. This interface, that works well enough on my MacBook pro, is a bit clunky on an iPad. The compose window simply doesn't work and in not editable. So, I write in the edit HTML window. Here, I cannot set the fonts or size unless I write HTML code. After I write in the edit HTML window, when I go back to the compose window, I can no longer sselect text and set the font. Am researching other ways to update my blog on an iPad. I was at an Apple store near Boston and inquired about the iPhone. Now, normally when one buys an iPhone in the US it is locked to AT&T. Meaning it costs $200 for a 16 Gb iPhone 3GS but you have to buy it with a 2 year contract. So they charge you for the full 2 years in advance. Which can make the price as much as $800 to $1000 depending on your plan. But the sales person there told me that I could also buy the iPhone unlocked for US$ 400 above this price. If this is true then the iPhone 3GS would cost $600 or about Rs 28000. This is considerably less than Vodafone's india pricing for the newly introduced iPhone 3GS that I posted about a few weeks ago. Scroll down for prices I wrote about. Or check Vodafone's or Airtel's sites. Of course, buying it 'officially' from Vodafone or Airtel gives you the peace of mind of support and a warranty. I don't have any actual experience of the support or warranty on an iPhone in india but from what people tell me, Vodafone doesn't actually repair your iPhone if it's broken. They send it to Bangalore and there, if your phone has not been waterlogged, or it hasn't fallen, it gets replaced. Just a few minutes ago. I'm in Londonderry which isn't in Ireland but in New Hampshire, USA. 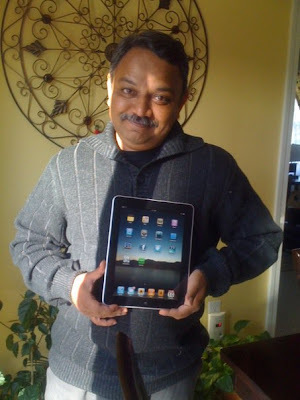 My niece's husband Amit Singh, very kindly booked an iPad for me as soon as it became available. And I got it from them as soon as I got to the US a few days ago. Before getting it I read reviews from many folks. Even heard a sneak preview by Andy Ihnatko before the iPad became available in stores. I pretty much agree with these folks on most of their observations. But, what, if anything, are my first impressions, and what's it going to be, for the iPad in India? For one thing, costly. If you check the eBay India prices you will find that the grey market is once again making use of the fact that this machine is not officially available in India. So they can sell it for a killing. Second, many of the apps available are not available if you have an Indian account. Big example, Apple's own Pages, Numbers and Keynote for iPad are not available to anyone in India. So, one of the prime reasons for me getting an iPad are now going to wait till I find a way out of getting Pages, Numbers, and Keynote. Among things that don't work for me are the placing of the backspace key - not like the iPhone keyboard. But doing a number key below the kept shift, just like the iPhone keyboard. Is a bit confusing. blogger.com does not work on the iPad for creating a post. The Compose window does not allow text entry. In fact this text was typed in on the iPad. But after saving, I've had to edit it on my MacBook Pro. Because, once again the compose window does not work. And I may find similar such niggles in the days to come as I make this my primary computing machine except for specialized tasks like editing etc. But for what it costs, and can do, this is a wonderful device. It's a computer in that I sends and receives email, does manage figures, keep notes, surf the web, look at pictures and many such things that I do everyday on my MacBook Pro. The keyboard is great for a nut and peck typist like me. And the machine feels smooth and very responsive, as good if not better than a real computer. And definitely better than the iPhone experience for may things. Labels: Apple iPad, iPad in India, pages numbers keynote not available on iPad india. iPad in india not all apps. Samsung has launched a range of 3D capable TV sets in India. There are LED, LCD and Plasma models. Details are a bit thin at the moment and all one has to go by is a press release at Samsung India's web site. The models will be available at stores all over India eventually. Model numbers according to the press release, are the LED 7000/8000 series, LCD 750 series and the Plasma+ 7000 series. There's also a 3D capable Blu-ray player the BD-C6900 and a Home theatre capable of 3D playback the HT-C6950. 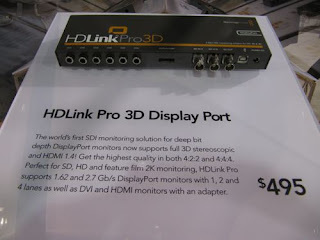 These 3D TV sets also have a capability of taking normal 2D content and converting it into 'pseudo-3D' which is probably interesting for sports and some movies. But when one browses TV sets at Samsung India's web site, for the 7000/8000 models there's no mention (yet) of 3D capability. These are the Series 7 and Series 8 LED models of the 'UA' prefix. The Samsung US web site mentions the 'UN' prefix model as 3D capable. So I guess we need to wait for an update to Samsung India's web site for details of local models. In the US these TV sets when bought with a compatible Bly-ray player comes with a starter pack with a 'Monsters vs Aliens' DVD, and two pairs of 3D glasses. Oh yes, you need glasses to see 3D. Interestingly these TVs also have an Ethernet jack so you can connect to the Internet and play apps for news, weather, etc. 'Convergence' yet again! More on 3D TV sets as I get real first hand information. And when I get to actually see one which could be as early as this week end. Incidentally there are some reports of the semi-finals and finals of the ongoing IPL T20 tournament being shot in 3D. But you won't be seeing these in 3D even with a Samsung 3D TV set since there is unlikely to be 3D telecasts anytime soon. We haven't even moved to HD yet.